Each year, members of the St. Clair Theatre Guild head out to share the holiday spirit with some special members of our community. This year’s Christmas Caroling will Monday, December 17, and everyone – current, former, and prospective guild members and friends – is invited! We’ll start at MediLodge (located behind Ascension River District Hospital on M-29 in East China) at 6:15 p.m. Those who’ve caroled with us before will note that time is 15 minutes earlier than in the past. We’ll move on to Mallard’s Landing around 7:30 p.m. Kim LaDuke will be accompanying us once again. After the caroling visits, an afterglow will take place. Details will be available to those who attend at either or both locations. Caroling is a fun evening and gives us a chance to entertain our senior friends and family. Come out and be part of the holiday spirit! Hope to see you there. This entry was posted in Community Event and tagged caroling on December 10, 2018 by Tom Kephart. 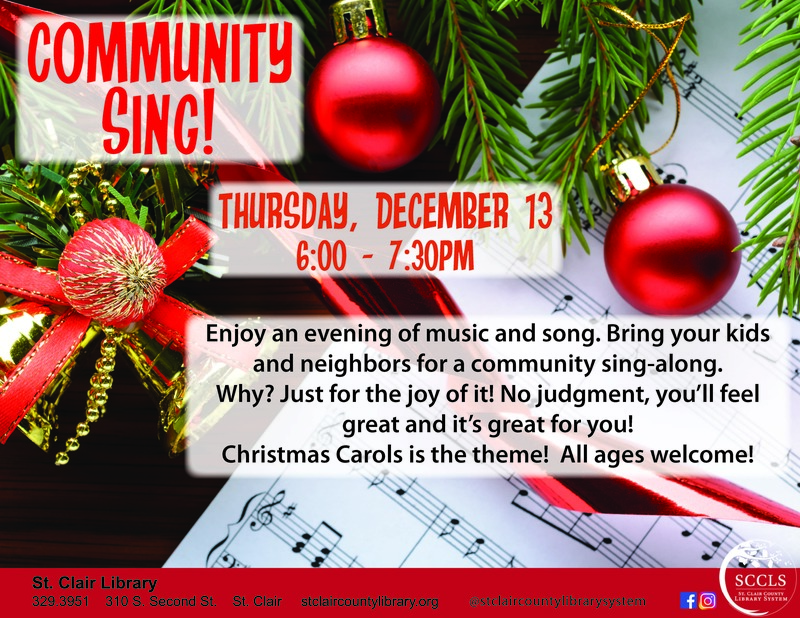 This entry was posted in Community Event and tagged community sing on November 26, 2018 by Tom Kephart. At the organizational board meeting on Tuesday, October 9, 2018, the board elected the following members as officers for the upcoming year: Tom Kephart, president; Brian Moss, vice president; Melanie Freeman, secretary; Kim LaDuke, treasurer. The board also took care of routine business, reviewed upcoming events, and discussed future plans. The next meeting of the board will be Tuesday, November 13 at 5:30 p.m. at the Guild Building. All members are welcome. This entry was posted in News on October 10, 2018 by Tom Kephart. 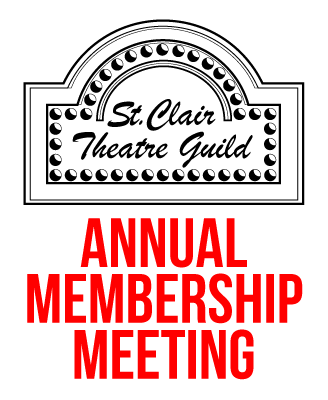 The Annual Membership Meeting of the St. Clair Theatre Guild was held on Sunday, September 16, 2018. A change to the by-laws was approved and an election for the board of directors was held. a. Power, Number and Eligibility – There shall be no more than sixteen and no fewer than eight members of the Board of Directors, which include the officers of the Guild. The exact number of directors shall be determined by the membership at the Annual Meeting. Directors must have been an active member for the Guild for one year or more. Directors must have been an active member for the Guild for one year or more. The new board will meet in October to select officers and begin planning for the next year. An informal social gathering following the business meeting. Total attendance was 17 members. This entry was posted in News and tagged annual meeting on September 17, 2018 by Tom Kephart.